Watching the peppers, corn, and tomatoes cropping up at the farmer’s market, I have known, with slight trepidation, that eggplant could not be far behind. Sure enough, last weekend, while browsing through some multi-colored bell peppers that I determined were past their prime, I happened across some pint baskets of white, purple, and streaky baby eggplants, the largest specimens no longer than 3 or 4 inches. They were such colorful little jewels that I let myself be tempted, also recalling that it is usually the very large eggplants that have the most issues with large seed pockets and bitterness. When I got my eggplants home, I had to decide what to make from them. My last eggplant encounter involved making fritters from mashed eggplant, which tasted alright but masked the eggplant so thoroughly that it might as well not be there. This time I wanted to showcase it more blatantly, so I selected a garlicky stir-fry dish to serve over chicken-fried rice. 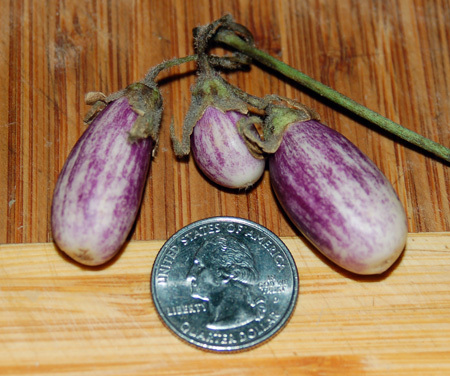 My eggplants were so small that I just trimmed their tops and sliced them in half the long way, not bothering to skin or salt them. The recipe called for steaming the eggplant before stir-frying, which allowed me to use my handy-dandy expanding steamer basket for the first time; it accommodated all the eggplant comfortably in my 10″ saute pan, and I also used it to steam some green beans (half of which went into the fried rice, and the remainder into the freezer). 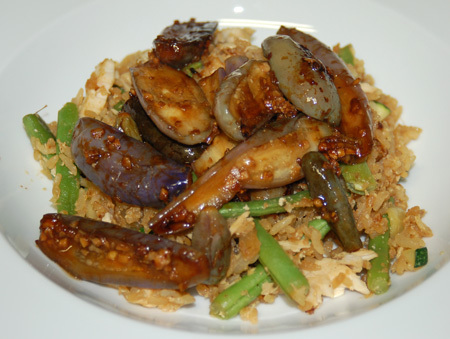 The tender eggplant was then quickly finished with fresh garlic and ginger, and a sauce of tamari, black vinegar, shaoxing wine, and sugar. I cut back drastically on the red pepper flakes and finished off the dish with a drizzle of sesame oil. Finally, I served it up with chicken fried rice made from onion, green beans, leftover roast chicken and ginger rice (a tablespoon of fresh ginger sauteed in a bit of oil with three scoops of jasmine rice, cooked in the rice cooker with stock replacing the water). I could have done with less sauce or more eggplant because the stir-fry was pretty strongly flavored, but the fried rice helped to temper it, and we happily gobbled it all down. It was so successful that I feel ready to move on to some more classic eggplant-centric dishes like moussaka, baba ghanouj, or eggplant parmesan. 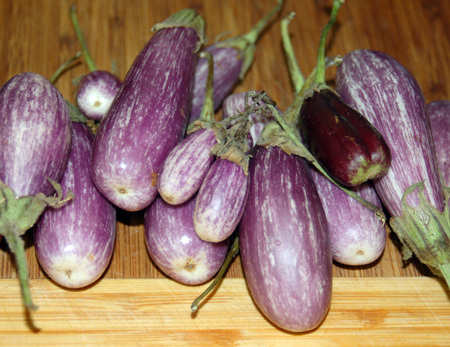 Cut the tops off the eggplants and slice them in half lengthwise; if you have larger ones, cut them into sticks or slices. In a small bowl combine the soy sauce, vinegar, rice wine, sugar, salt, and pepper flakes. Set aside. Source: The Breath of a Wok , via The Perfect Pantry. Ooh! What about ratatouilli? I actually do mine in a large lasagne pan right out on the gas grill. That way the house stays cool and I can sit out and read a book while stirring every few minutes!